Oteria Broady (left) and Ettrula Moore (right). Not pictured is Ione Callendar. The exhibit focuses on some of the men and women who have returned to their native home of Clifton Forge to be role models and to serve and inspire all students in the area schools. It also lists some of the educators who have roots in Clifton Forge but who left the area to have distinguished careers elsewhere. Also included are some of the past educators who taught at the old Jefferson School during the late 1880s through 1965, and who made a positive impact on education in the black community. 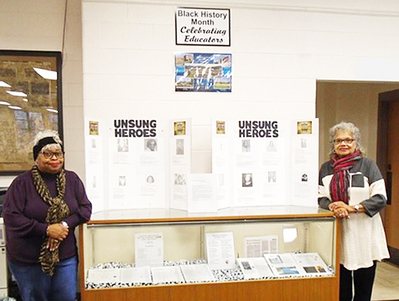 The Black History Month “Celebrating Educators” exhibit will be on display at the Clifton Forge Public Library throughout February. The Library is located at 535 Church Street. For information on any library programs or activities, phone 863-2519.